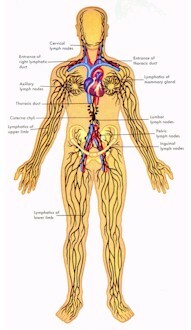 Lymphatic congestion or stagnation is a serious problem for many cancer patients. Undigested food, infectious material, dead cells, toxins, and other debris have to be carried off by the lymphatic system. Thickened and sluggish lymph results in swelling and discomfort. Indigo Drops gets its name from "wild indigo", an adaptogenic plant with an affinity for the upper part of the body, especially the respiratory system. Indigo Drops is a potent antiviral and lymph stimulating formula. It was developed in response to needs for effective lymphatic relief where the cause of the congestion is presumed to be an underlying infection, often chronic and undiagnosed. It works best when combined with one of Ingrid's lymph stimulating teas. Contains: Proprietary blend galangal [Alpinia officinarum] root, goldenseal [Hydrastis canadensis] root, baptisia [Baptisia tinctoria] root, lomatium [Lomatium dissectum] root, stillingia [Stillingia sylvatia] root, St. John's wort [Hypericum perforatum] herb, burdock [Arctium lappa] root, poke root [Phytolacca americana] root, bloodroot [Sanguinaria canadensis] root, Corydalis yanhusuo tuber, Oregon grape [Mahonia aquifolium] root, and Lobelia inflata herb in organic grain alcohol, distilled water, pure vegetable glycerin, and organic cider vinegar.